What Is A Torn Hip Labrum and How Is It Fixed? 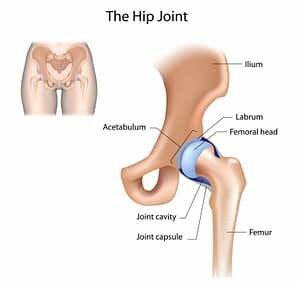 The hip is a ball and socket joint composed of the head of the femur and acetabulum. In order to prevent instability and bone-on-bone contact, the soft tissue labrum surrounds the outside edge of the acetabulum. A labral tear can result in pain, instability, stiffness, and decreased function. Tears in the labrum should be treated appropriately in order to prevent arthritis. If the damage to the labrum progresses, it can cause the bones of the hip joint to begin to rub together. This rubbing can cause bone spurs and arthritis in the hip, which may severely damage the hip joint and result in the need for Total Hip Replacement. Surgery repairs the labrum as well as any cartilage that has been damaged. Using a small camera, known as an arthroscope, the surgeon is able to access the hip joint and view the labrum in detail. Once the tear has been identified, loose pieces of cartilage can be trimmed away as well as any bone spurs that may have formed. The goal is to restore the integrity and function of the joint so the patient can live a normal, pain-free life. Following surgery, Physical Therapy is used to regain strength and stability in the hip joint. The recovery time depends on the severity of the tear, but generally takes only a few weeks. High Mountain Orthopedics specializes in bone, joint and muscle injuries, including hip injuries. Dr. William Matarese Dr. Tony Wanich and Dr. Sherwin Su have over 25 years of combined experienced treating orthopedic and sports injuries. Our practice uses a multi-disciplinary approach that includes physical therapy and activity modification. If surgery is necessary, our team utilizes the latest advancements in Minimally Invasive and Arthroscopic procedures to expedite the healing process. If you are suffering from a bone, joint or muscle injury – contact our offices today! We have locations in Wayne, Ridgewood and Englewood, NJ.